The Nobel Prize in Literature (Swedish: Nobelpriset i litteratur) is awarded annually by the Swedish Academy to authors for outstanding contributions in the field of literature. It is one of the five Nobel Prizes established by the 1895 will of Alfred Nobel, which are awarded for outstanding contributions in chemistry, physics, literature, peace, and physiology or medicine. As dictated by Nobel's will, the award is administered by the Nobel Foundation and awarded by a committee that consists of five members elected by the Swedish Academy. The first Nobel Prize in Literature was awarded in 1901 to Sully Prudhomme of France. Each recipient receives a medal, a diploma and a monetary award prize that has varied throughout the years. In 1901, Prudhomme received 150,782 SEK, which is equivalent to 7,731,004 SEK in December 2007. In 2012, the prize was awarded to Mo Yan of China. 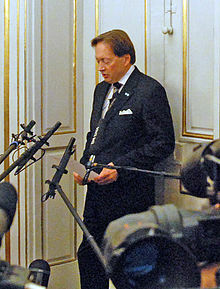 The award is presented in Stockholm at an annual ceremony on December 10, the anniversary of Nobel's death. As of 2012, the Nobel Prize in Literature has been awarded to 109 individuals. When he received the award in 1958, Russian-born Boris Pasternak was forced to decline it under pressure from the government of the Soviet Union. In 1964, Jean-Paul Sartre refused to accept the Nobel Prize in Literature, as he had consistently refused all official honors in the past. Twelve women have won the Nobel Prize in Literature, more than any other Nobel Prize with the exception of the Nobel Peace Prize. Among all the years the Nobel Prize in Literature has been awarded, there have been only four instances in which the award was given to two individuals (1904, 1917, 1966, 1974). There have been seven years in which the Nobel Prize in Literature was not awarded (1914, 1918, 1935, 1940–1943). ১৯১৩ ৰবীন্দ্ৰনাথ ঠাকুৰ ভাৰত বাংলা "because of his profoundly sensitive, fresh and beautiful verse, by which, with consummate skill, he has made his poetic thought, expressed in his own English words, a part of the literature of the West"
১৯৮২ গেব্ৰিয়েল গাৰ্চিয়া মাৰ্কুজ কলম্বিয়া স্পেনিছ "for his novels and short stories, in which the fantastic and the realistic are combined in a richly composed world of imagination, reflecting a continent's life and conflicts"
২০০০ গাঅ' ঝিংজিয়ান ফান্স চীনা "for an oeuvre of universal validity, bitter insights and linguistic ingenuity, which has opened new paths for the Chinese novel and drama"
ট্ৰিনিদাদ আৰু ট'বেগ' ইংৰাজী "for having united perceptive narrative and incorruptible scrutiny in works that compel us to see the presence of suppressed histories"
২০০২ ইম্‌ৰে কে'ৰ্টেজ হাংগেৰী হাংগেৰীয়ান "for writing that upholds the fragile experience of the individual against the barbaric arbitrariness of history"
২০০৩ জে. এম. কয়েৎজে দক্ষিণ আফ্ৰিকা ইংৰাজী "who in innumerable guises portrays the surprising involvement of the outsider"
২০০৪ এল্‌ফ্ৰিডা জে'লিনে'ক অষ্ট্ৰিয়া জাৰ্মান "for her musical flow of voices and counter-voices in novels and plays that with extraordinary linguistic zeal reveal the absurdity of society's clichés and their subjugating power"
২০০৫ হেৰল্ড পিণ্টাৰ সংযুক্ত ৰাষ্ট্ৰ ইংৰাজী "who in his plays uncovers the precipice under everyday prattle and forces entry into oppression's closed rooms"
২০০৬ হৰহান পামুক তুৰস্ক তুৰ্কি "who in the quest for the melancholic soul of his native city has discovered new symbols for the clash and interlacing of cultures"
২০০৭ ড'ৰিছ লেচিং সংযুক্ত ৰাষ্ট্ৰ ইংৰাজী "that epicist of the female experience, who with scepticism, fire and visionary power has subjected a divided civilisation to scrutiny"
মৰিচাছ ফ্ৰেঞ্চ "author of new departures, poetic adventure and sensual ecstasy, explorer of a humanity beyond and below the reigning civilization"
ৰোমানিয়া জাৰ্মান "who, with the concentration of poetry and the frankness of prose, depicts the landscape of the dispossessed"
স্পেইন স্পেনিছ "তেখেতৰ ক্ষমতাৰ গঠনৰ অংকন আৰু ব্যক্তিগত বিৰোধ, বিদ্ৰোহ আৰু পৰাজয়ৰ মৰ্মভেদী চিত্ৰাংকনৰ বাবে"
(Tomas Tranströmer) ছুইডেন ছুইডিছ "কাৰণ তেখেতৰ পাৰদৰ্শী আৰু সংহত চিত্ৰকল্পই আমাৰ বাবে বাস্তৱৰ এক ন-দুৱাৰ মেলি দিয়ে"
(ইংৰাজী: Mo Yan) চীন চাইনীজ "যিজনে দৃষ্টিভ্ৰমিত বাস্তৱতাৰে লোক-সাধু, বুৰঞ্জী আৰু সমসাময়িকক বান্ধি ৰাখিবলৈ সক্ষম"
↑ "Alfred Nobel – The Man Behind the Nobel Prize". Nobel Foundation. http://nobelprize.org/alfred_nobel/। আহৰণ কৰা হৈছে: 2008-10-16. ↑ "The Nobel Prize Awarders". Nobel Foundation. http://nobelprize.org/prize_awarders/। আহৰণ কৰা হৈছে: 2008-10-16. ↑ "The Nobel Prize". Nobel Foundation. http://nobelprize.org/nobel_prizes/। আহৰণ কৰা হৈছে: 2008-10-07. ↑ 4.0 4.1 "Nobel Prize in Literature 2012". Nobel Foundation. http://www.nobelprize.org/nobel_prizes/literature/laureates/2012/। আহৰণ কৰা হৈছে: 11 October 2012. ↑ "The Nobel Prize Award Ceremonies". Nobel Foundation. Archived from the original on 2008-08-22. http://web.archive.org/web/20080822184717/http://nobelprize.org/award_ceremonies/। আহৰণ কৰা হৈছে: 2008-10-16. ↑ 6.0 6.1 "All Nobel Laureates in Literature". Nobel Foundation. http://nobelprize.org/nobel_prizes/literature/laureates/। আহৰণ কৰা হৈছে: 2008-10-16. ↑ "Nobel Laureates Facts". Nobel Foundation. http://nobelprize.org/nobel_prizes/nobelprize_facts.html। আহৰণ কৰা হৈছে: 2008-10-16. ↑ "Women Nobel Laureates". Nobel Foundation. http://nobelprize.org/nobel_prizes/lists/women.html। আহৰণ কৰা হৈছে: 2008-10-16. ↑ "Nobel Prize in Literature 1913". নবেল ফাউণ্ডেচন. http://nobelprize.org/nobel_prizes/literature/laureates/1913/index.html। আহৰণ কৰা হৈছে: 2008-10-17. ↑ "Nobel Prize in Literature 1982". নবেল ফাউণ্ডেচন. http://nobelprize.org/nobel_prizes/literature/laureates/1982/index.html। আহৰণ কৰা হৈছে: 2008-10-17. ↑ "Nobel Prize in Literature 2000". Nobel Foundation. http://nobelprize.org/nobel_prizes/literature/laureates/2000/index.html। আহৰণ কৰা হৈছে: 2008-10-17. ↑ "Nobel Prize in Literature 2001". Nobel Foundation. http://nobelprize.org/nobel_prizes/literature/laureates/2001/index.html। আহৰণ কৰা হৈছে: 2008-10-17. ↑ "Nobel Prize in Literature 2002". Nobel Foundation. http://nobelprize.org/nobel_prizes/literature/laureates/2002/index.html। আহৰণ কৰা হৈছে: 2008-10-17. ↑ "Nobel Prize in Literature 2003". Nobel Foundation. http://nobelprize.org/nobel_prizes/literature/laureates/2003/index.html। আহৰণ কৰা হৈছে: 2008-10-17. ↑ "Nobel Prize in Literature 2004". Nobel Foundation. http://nobelprize.org/nobel_prizes/literature/laureates/2004/index.html। আহৰণ কৰা হৈছে: 2008-10-17. ↑ "Nobel Prize in Literature 2005". Nobel Foundation. http://nobelprize.org/nobel_prizes/literature/laureates/2005/index.html। আহৰণ কৰা হৈছে: 2008-10-17. ↑ "Nobel Prize in Literature 2006". নবেল ফাউণ্ডেচন. http://nobelprize.org/nobel_prizes/literature/laureates/2006/index.html। আহৰণ কৰা হৈছে: 2008-10-17. ↑ "Nobel Prize in Literature 2007". Nobel Foundation. http://nobelprize.org/nobel_prizes/literature/laureates/2007/index.html। আহৰণ কৰা হৈছে: 2008-10-17. ↑ "The Nobel Prize in Literature 2008". Nobel Foundation. http://nobelprize.org/nobel_prizes/literature/laureates/2008/index.html। আহৰণ কৰা হৈছে: 2008-10-14. ↑ "The Nobel Prize in Literature 2009". Nobel Foundation. http://nobelprize.org/nobel_prizes/literature/laureates/2009/index.html। আহৰণ কৰা হৈছে: 2009-10-08. ↑ "The Nobel Prize in Literature 2010". নবেল ফাউণ্ডেচন. http://nobelprize.org/nobel_prizes/literature/laureates/2010/index.html। আহৰণ কৰা হৈছে: 2010-10-07. ↑ "The Nobel Prize in Literature 2011". নবেল ফাউণ্ডেচন. http://www.nobelprize.org/nobel_prizes/literature/laureates/2011/। আহৰণ কৰা হৈছে: 2011-10-06. Read the Nobels - a collaborative Litblog featuring reviews of individual books by Nobel Laureates.